Tigercat has released the D-series shovel loggers in North America. Operating at 210 kW (282 hp), the Tigercat FPT powered S855D and LS855D meet Tier 4 emission requirements. Tigercat FPT engines offer improved reliability and lower long-term maintenance costs. Best of all, the engines are fully supported by Tigercat and the Tigercat dealer network. Tigercat will continue to offer the C-series shovel loggers in South America, Australia and New Zealand. The S855D series shovel loggers are a uniquely versatile solution for steep slope and sensitive site logging applications. The LS855D is a quick, nimble and powerful carrier — well suited to felling, pre-bunching and shovel logging on steep terrain. The LS855D is commonly equipped with a feller director boom and the Tigercat 5195 directional felling head for felling and shovel logging. Alternatively the carriers can be equipped with a live heel boom system and grapple for pure shovel logging. Along with the high flotation undercarriage, this is an excellent configuration for southern US style log mat-based lowland logging applications. With the patented Tigercat ER boom and energy recovery swing system, the S855D series shovel loggers can cost effectively forward wood to roadside in steep or wet soil conditions up to distances of 80-100 m (260-330 ft). A shovel logger can be strategically located in challenging parts of the cut block to forward trees to the skidder or fell and bunch for a yarding system. 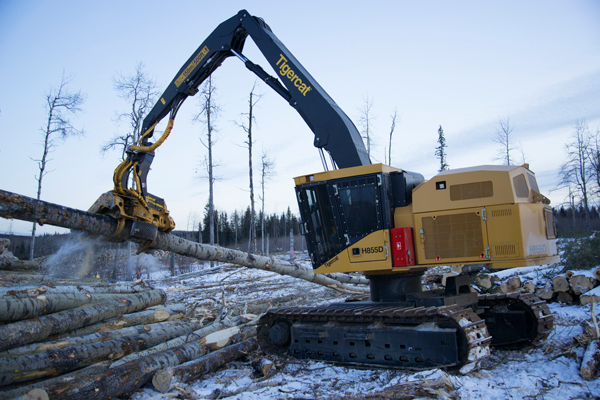 Unlike excavator-based shovel loggers with add-on forestry packages, the S855D and LS855D are purpose-built for heavy duty forestry applications. The efficient hydraulic system is optimized for shovel logging and felling with a directional felling head. The LS855D is equipped with Tigercat’s patented levelling system, providing exceptional stability in steep slope applications. It uses two massive hydraulic cylinders and heavy steel sections for a solution that is both simple and robust. The unique geometry of the levelling system promotes balance, poise and stability on slopes. In addition, the ramped undercarriage allows the machines to easily drive up over rocks and stumps.